The game is set up like this: the class is divided into three groups. The first are freedom-seekers, whose goal is to get over Der Berliner Mauer by throwing a stuffed animal over the eight-foot fence at the end of the football field. The second group are East German Stasi agents, who have to hunt down the freedom-seekers and prevent them from getting away to West Germany. The final group are neutral parties who may or may not sympathize with the socialist ideals of the Deutsche Demokratische Republik, depending on what they want to do. I hide stuffed animals in places all around the football field: in the stands, near the bathroom, I sometimes bury the animals in the sand of the long jump pit. 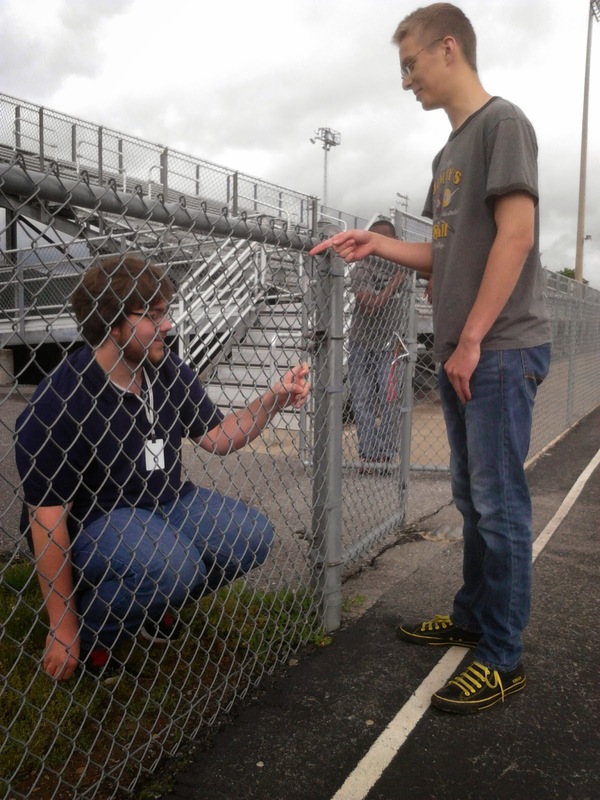 The freedom-seekers have to first find clues hidden in the school, then go out to the football field to find their animals, then get the animals over the wall. After letting students draw their roles, I give them time to think, then dismiss them as URO's techno version of "Auferstanden aus Ruinen" (East Germany's expired--but beautiful--national hymn) follow them through the halls. 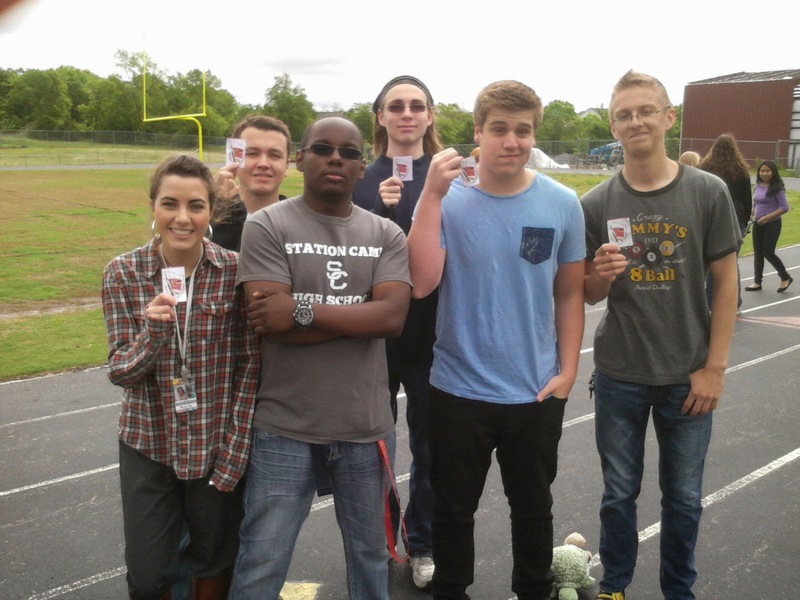 The students are dismissed one by one, giving them some distance to hunt for clues or hunt for freedom-seekers. Eventually we all reach the field, where the fun really goes down. I'll narrate with the pictures below. Rachel C, in the green dress, was the first person to escape--she made it before I could even make it out to the field. 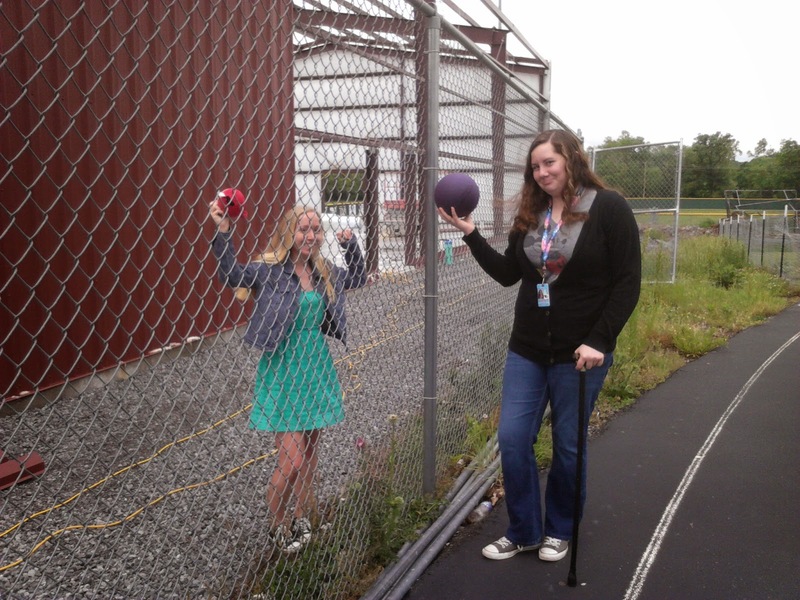 According to my "dictator," a junior who had taken German 2 last year and helped me manage the event, she didn't just throw her Angry Bird over the fence, she actually climbed it in two steps and threw herself over--in a dress and Converse sneakers, no less! Hers was definitely the most athletic escape of the day. To her right is Sarah, a border guard, still threatening with her rubber "bullet." Our three successful escapees, Stefani, Rachel C, and Alex, with their "free" stuffed animals. Stefani was actually arrested by the Stasi, and the Dictator confiscated her stuffed toy, snuffing her hopes for freedom, and sending her away. But the love for freedom doesn't end when someone gets out of jail. Stefani actually stuck around the Dictator, chatted him up, then stole the stuffed toy, raced to the wall, and threw it over. What a remarkable display of determination! Here's Shaun, who made a dramatic run for the wall, but he was tagged and captured. I told him: "If you thought East Germany was a prison, just wait 'til you see an East German prison!" This was the closest we got to an East German Jail, and Stasi agent, Isaac, can't get enough of taunting him there. This is my group of Stasi agents. They protected the Socialist Fatherland, arresting three of the five students who tried to get their stuffed animals over the wall. Morgan, Ashe, Oliver, Colton & Isaac. They surround The Man, a.k.a. the Dictator of the Day, Jordan, an alum of last year's class who helped me manage the game this year.